As business grows, too often customer service and client communication can take a dive. We didn’t want that to happen at Acquisio and took extra steps to make sure that while our business grew and ventured into new areas, we still paid extra attention to our current clients. While looking for a way to engage our users and collect valuable feedback on our products and activities, and to generate more referrals, we found Influitive and their Advocate Marketing Software. 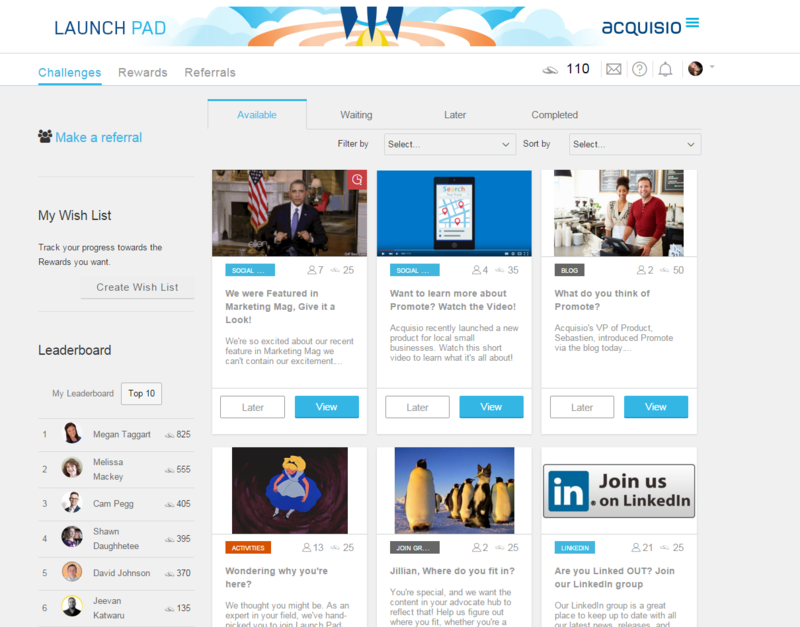 After building out own Advocate Marketing Hub, it’s our great please to announce that “Launch Pad” is now live! What’s Launch Pad All About? Launch Pad is a place for our clients to go and learn about our newest releases, engage with us socially, send us product feedback, refer potential clients and engage with the Acquisio team on a more personal level. Plus, it’s fun and easy. With a quick glance at how Launch Pad looks, it’s easy to see that the content is more engaging than any email, survey or referral request we could send out. Our clients have enjoyed completing activities, earning points and getting closer to claiming rewards, like swag, gift cards and tickets to industry events. Even a fishing trip with CEO Marc is up for grabs! Referred prospects are 30% more likely to convert than other generated leads, and have a 16% higher life-time value. With that in mind, creating a fun environment where our clients feel comfortable sharing was important for us to grow. After launching internally, we releasing Launch Pad to a select group of users and partners November 10th, and we were able to surpass our month’s goal of 30 engaged advocates in just one day! Looks like our goals were too modest. And in just one day we were able to learn so much from our users, including what features they wish for, what pain points they’re experiencing, and we’ve even been able to add members to our reference and beta testing groups. Launch Pad is really just the beginning. While some of our competitors may not see the value in investing time in their clients, we are dedicated to providing a better service to all our users, and the first step is listening and encouraging communication. Along with Launch Pad, we will be implementing Intercom in our support process as well, to connect with our clients as quick as possible, so issues and questions can be answered and resolved more efficiently. Stay tuned for more Advocate Marketing Initiatives and information. If you’re a client interested in joining our hub, simple contact us about joining!